12 Red Roses Bouquet,1kg Cake with choice of your own flavor & 1 Teddy bear 6 inches. 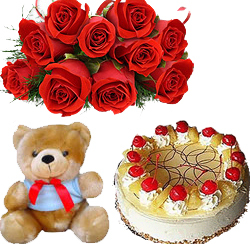 Send this beautiful special combo to your dear one any occasion.One of our special gift hampers is the Great Combo Special; it consists of a lovely bouquet of red roses, a one kg cake of the flavor of your choice (flavors include Butterscotch, Vanilla, Pineapple, Strawberry, Black Forest and Chocolate) and a cute 6 inch teddy bear. Our expert florist has arranged the 12 red roses beautifully in a bouquet. The Great Combo Special is an ideal gift for your loved one and can be sent on birthday, anniversary and Valentine’s Day. Send roses bouquet online to your loved ones and convey your loving sentiments on any occasion.